What Anna needs next are guests -- to add to the elderly tortoise upstairs, just awakened from hibernation. Anyone else might turn away the family of cockroaches who asked for a room, but Anna wants Hotel Flamingo to be open to anyone. She has a big idea, too, and it involves a lot of pink flamingos. There will be bumps along the way, but Anna is determined that Hotel Flamingo will return to being the sunniest hotel on Animal Boulevard. 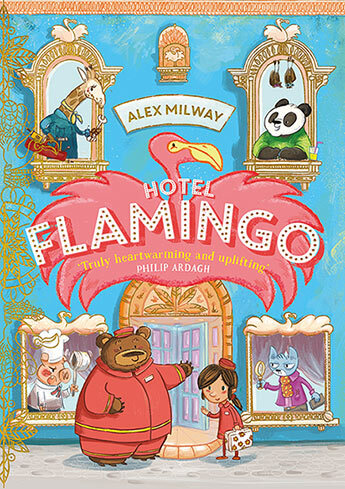 Hotel Flamingo is a positive and uplifting story with appealing characters, and a plot that bounces along at a swift pace. 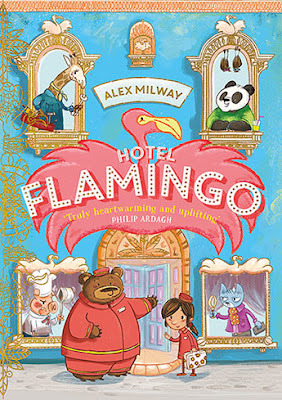 Accompanying cartoonish illustrations by author/illustrator Alex Milway are sweet and, like the chapter breaks, are generously spread throughout. An endearing book for beginning and newly independent readers.